Alan D. "Al" Ashley joined Kaman Aerospace in 1958 as a test pilot. During his career, he was involved in almost every flight test and development aircraft program at Kaman. These included both the Navy HUK- 1 and Air Force H-43 A&B “Husky” series, followed by the original Navy HU2K-1 single engine configuration and each of its subsequent mission variants up to the current SH-2G twin engine configuration. Al completed his work at Kaman guiding the development and testing of the K-MAX commercial external lift helicopter. 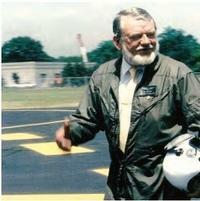 He was promoted to Vice President/Chief Test Pilot in 1986, a post which he held until his retirement in 1994. In addition to his overall test and production responsibilities, Al supported and guided Kaman’s efforts in VTOL research and development programs, including the UH-2 Compound and Circulation Control Rotor (CCR) helicopter programs as well as guiding the development of new rotor blades such as the Army K-747 rotor blade, the Navy 101 servo-flap controlled rotor blade and the SH-2G CMRB composite rotor blade (CMR) programs. Al served in the US Marine Corps and was a member of AHS International, the Society of Experimental Test Pilots and the Navy League.